A real-world example from 2014 estimates the cost of the European Union ban on neonicotinoids for United Kingdom farmers to be $33 million for alternative pesticide use, lost crops, and replanting crops. What’s worse, the ban on neonicotinoids in the European Union has not reduced the risk to honeybee colonies. Honeybees across the world are in a sticky situation. Their numbers are dwindling dramatically due to colony collapse disorder (CCD) for reasons that are not fully understood. Yet the honeybee population in Israel is holding steady. 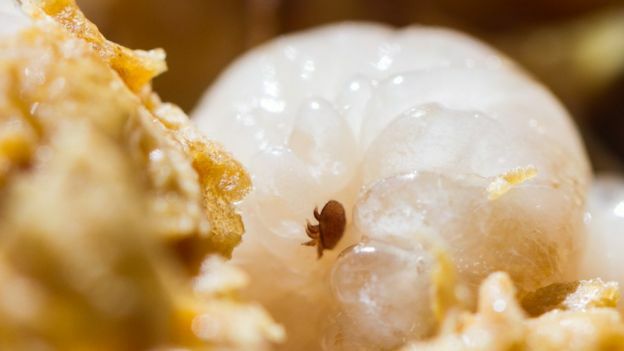 The first step in avoiding CCD is to follow Ministry of Agriculture guidelines for eradicating Varroa mites, a parasite considered a core cause of CCD. Bee Pharma Africa hopes to build a coalition for research in the use of bee propolis and other bee products for treating human diseases. Hugo Fearnley of Whitby, England is studying the potential of bee-produced medicines for the treatment of human diseases. Fearnley, CEO of BeeVital and Director of the Apiceutical Research Centre (ARC), recently earned a Churchill Travelling Fellowship to fund his research and coalition-building in four African countries. The benefits of neonicotinoid seed treatment to soybean farmers have received increased scrutiny. Rather than use data from small-plot experiments, this research uses survey data from 500 US farmers to estimate the benefit of neonicotinoid seed treatments to them. As seed treatment users, farmers are familiar with their benefits in the field and have economic incentives to only use them if they provide value. Editor’s Note: For additional data on the economic value of neonicotinoid-treated seeds, see here and here. Agricultural economists at the University of Minnesota and University of Wisconsin published new research showing the value that neonicotinoid seed treatments create for farmers. Dr. Terrance Hurley at the University of Minnesota and Dr. Paul Mitchell at the University of Wisconsin published their work in the leading journal, Pest Management Science. Based on their analysis of survey data, neonicotinoid seed treatments are popular among U.S. soybean growers, adding an average value of $11.35 per acre and $389 million to U.S. soybean growers in 2013. PIERRE, S.D.- The South Dakota Department of Agriculture (SDDA) has drafted a Managed Pollinator Protection Plan outlining efforts to protect honeybees, improve hive health, improve habitat and facilitate communications between beekeepers, landowners and crop producers. A bee diagnostic centre is looking to save our most useful insects. The first month of Kaitlin Patterson’s summer was spent crushing up dead honeybees by hand. It got easier when she was able to use a “stomacher machine,” similar to a blender, to speed up the task. “Instead of having the bees in a bag, mashing them by hand, we’d put them in this machine,” says Patterson. “Where we would normally be able to do 30 samples in a day, we got up to 120 done in the same timeframe.” With the welfare of the world’s honeybees in drastic decline, this might seem callous. It’s not. It’s science—and it’s an essential element to help the insects regain their numbers. Can tech keep the world’s bees buzzing? The plight of the honey bee is a major cause of concern for the world’s scientists, environmentalists and the food industry, not to mention beekeepers. There are a number of reasons for this dramatic fall. One is the deadly varroa destructor, a parasitic mite that feeds on bees, and can kill off a whole hive. At present, varroa infestations can be controlled, but not removed completely. The U.S. Environmental Protection Agency should not be regulating neonicotinoid seed treatments in the same way it regulates other pesticide applications, the agency and a list of agriculture companies and interest groups told a federal court Friday. The agency filed a motion for summary judgement in the U.S. District Court for the District of Northern California in San Francisco. It was joined in that motion by CropLife America, American Seed Trade Association, Agricultural Retailers Association, American Soybean Association, National Cotton Council of America, National Association of Wheat Growers and National Corn Growers Association. The motion asks the court to rule in their favor on a lawsuit environmentalists and beekeepers filed earlier this year. Commercial beekeepers have increasingly struggled with high rates of colony morbidity and mortality, in part because of increased pressure of the parasitic varroa mite (Varroa destructor), pathogens (primarily viruses and bacterial infections), pesticide contamination of hive matrices, poor nutrition, and frequent queen losses. Low amounts of neonicotinoid insecticides… were found in six wax samples; two were contaminated with imidacloprid… The majority of [bee health problems] came from the presence of varroacides (71.1%), followed by insecticides (28.3%) and fungicides (0.5%), while herbicides contributed minimally (<0.01%).